Nikon's first attempt to produce photographic lenses dates back to the early 1930's, when a fellow camera manufacturer - Konishiroku (alias Konica) - used Nikon's Anytar-Anastigmat 4.5/12 cm. 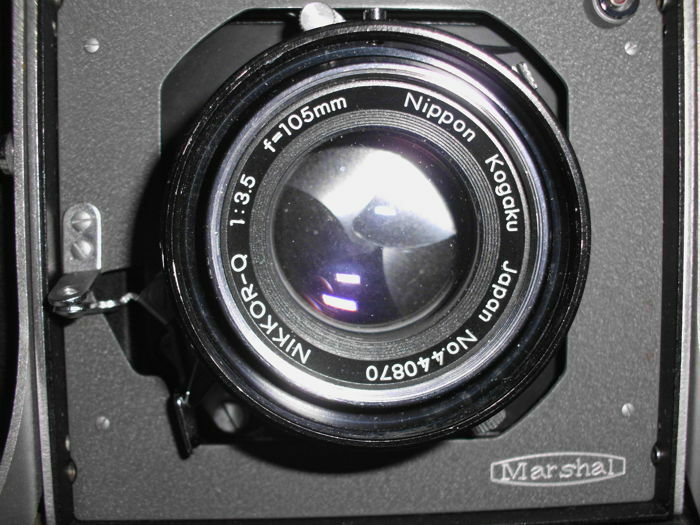 Later other camera manufacturers were using Nikkor lenses, like Mamiya in its Mamiya-Six camera (Nikkor 4.5/7.5 cm.) or in the Rolleiflex-based Airesflex camera made by Aires Camera Co. (Nikkor 3.5/7.5 cm.). Aires Camera Co. started in Japan in 1949 as Yallu Optical Co., but changed that name in August 1950 in Aires Camera Works. 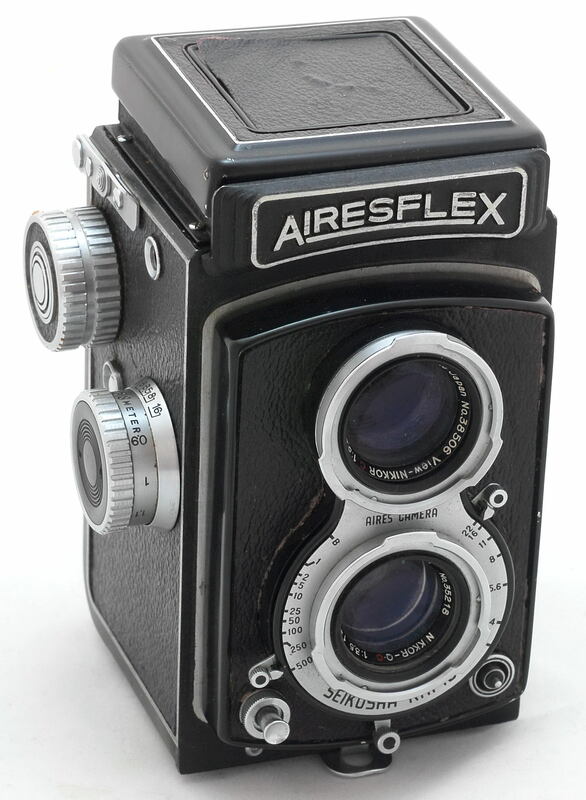 The Aires Reflex and Aires Automat 6x6cm-format twin-reflex camera with a Seikosha-Rapid MX shutter (1-1/500 sec.) featured a Nikkor 3.5/75 mm. quadruplet taking lens and a View-Nikkor 3.2/75 mm (!) triplet viewing lens. The cameras (cheaper versions!) were also fitted with Coral and Zuiko lenses. Unfortunately the company went bankrupt in July 1960. 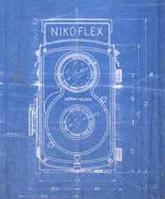 Nikon Corporation itself started to develop a Rolleiflex clone (6x6 twin lens reflex for 120 film) in 1946 - named Nikoflex - fitted with a Nikkor 3.5/80 mm. lens. The design was dropped - however - after some months as the Nikon engineers didn't trust the reliability of the shutter. * Medium film format (aka 120 roll film) was introduced in 1901 by Kodak for its Brownie No. 2. It is a 7 cm wide film with paper back for image formats of 4.5x6, 6x6, 6x7, 6x8, 6x9, 6x12, 6x17 and 6x24mm. The latter three for panoramic cameras. The 220 roll film (twice as long as the 120) was introduced in 1965. The two most prominent camera manufacturers using Nikkor lenses for their large format cameras were the German Plaubel GmbH and the Japanese Zenza Bronica Industries, Inc.
Plaubel GmbH was founded on November 1, 1902 by Hugo Schrader (1873-1932). Hugo Schrader was trained at the famous Voigtländer factory in Braunschweig. In 1900 he found employment in the lens factory of his father-in-law in Frankfurt-Bockenheim, the well-known Dr. Rudolf Krügener. Hugo's brother-in-law, Karl Plaubel, lend his name to the camera series. 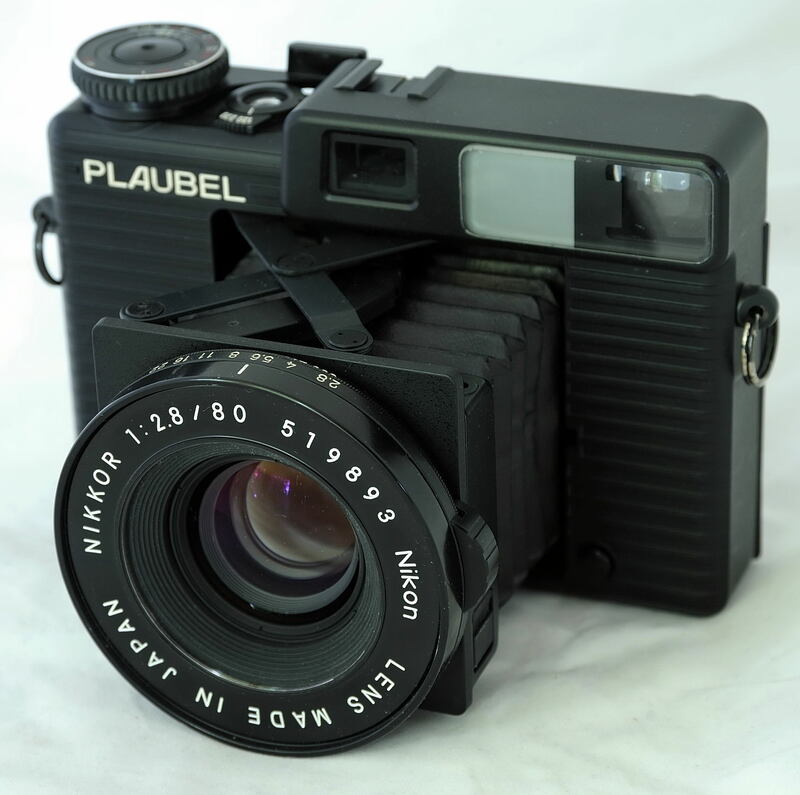 From 1911 - 1986 Plaubel GmbH produced a series of large format press cameras. The best known Plaubel camera fitted with a non-exchangeable Nikkor lens was the Plaubel Makina (see below), marketed in the 1970's. This camera was developed by Hugo's son Goertz Schrader, who came in the factory in 1925 and took over the company in 1939 after his father died. Plaubel GmbH was taken over by Kimio Doi (of Doi Co., Japan) in 1975. That company stopped making Plaubel cameras, only Horseman and Toyo large format cameras, using lenses of lens makers other than Nikon Corporation, are presently marketed. Nevertheless the Nikkors, made for the Plaubel cameras, still have an impressive reputation among amateur and professional photographers! Nikkor 2.8/80 mm. ; 6 elements in 4 groups, multicoated, stepless aperture f/2.8 - f/22, viewing angle 59°, filter size 58 mm. closest distance 1 meter. Wide-Nikkor 4.5/55 mm. ; 6 elements in 4 groups, multicoated, stepless aperture f/4.5 - f/22, viewing angle 77°, filter size 62 mm. closest distance 0.8 meter. Because of the relatively large rear element both lenses have no vignetting. Both lenses have a Special Copal In-lens fully mechanical central shutter, running from 1/500 sec. to 1 sec. + B., making flash photography possible at all shutter speeds. Zenza Bronica is the brand name of the cameras produced by Mr. Zenzaburo Yoshino (1911-1988), who opened in 1946 a camera store in Tokyo. As times were hard he manufactured and sold gas lighters and other accessories. In his workshop he started in 1947 to develop his own camera. In 1958 he founded Zenza Bronica Industries, Inc. The Swedish Hasselblad look-alike camera series made use of a series of Nikkor lenses since 1959. Unfortunately the excellent Bronica cameras left the photography market in 2005. Nikkor 4/30 mm. (prototype only); Nikkor-D 4/40 mm. ; Nikkor-0 2.8/50 mm. ; Nikkor-H 3.5/5 cm. ; Nikkor-P 2.8/7.5 cm. (later 2.8/75 mm. ); Nikkor-Q 3.5/105 mm. ; Nikkor-Q 3.5/13.5 cm. ; pre-set Nikkor 2.5/18 cm. ; Nikkor-P 4/20 cm. / 4/200 mm. ; Nikkor 4/25 cm. ; Nikkor PC 5.6/300 mm. ; Nikkor 4.5/35 cm. ; Nikkor-QC 4.5/400 mm. ; Nikkor 5/50 cm. ; Nikkor-P/PC 5.6/600 mm. ; Nikkor-P/PC 8/800 mm. ; Nikkor-P/PC 11/1200 mm. Most lenses exist in a version with 'Nippon Kogaku Japan' and 'Nikon' inscription. Most Nikkor-lenses mentioned before were produced later by Bronica itself and were named 'Zenzanon'. See for an overview this matrix. Above: popular potrait lens: Nikkor-P 4/200 mm. Another Japanese camera producer was the Marshal Optical Works in Tokyo, introducing in 1966 its Marshal Press camera for 6 x 9 cm. images on a 120/220 rollfilm. This camera was designed by Mr. Seichi Mamiya, founder of Mamiya Cameras. The camera was fitted with a Nikkor-Q 3.5/105 mm lens. Also available were two converter lenses to placed onto the frontlens, making the standard Nikkor a 4.7/135 mm and 5.6/150 mm. lens. The camera had a Seiko leaf shutter. Nowadays very rare.